Oh yes, it's that time of the month again, it's my usual baking post, in the past we have had Onion Bread, Double Chocolate Muffins and Healthy Fruitburst Muffins so today, I thought I would bake a cheese cake. I thought I would share with you my ultimate favourite white chocolate Raspberry Swirl Cheesecake and a gingernut biscuit base, YUM! Now the reason I added a picture of the chocolate is because I cannot stress enough how important it is to use good quality chocolate, I really hate it when people just use cooking chocolate. I understand that those types of products melt quicker but the reality is the the taste just is not the same. So when I bake I always make sure I use the products that I know I love and Green and Blacks is one of them. Whilst I have taken a picture of the book to include the ingredients and method I thought I would just break down how I actually made the cheesecake because if you have read my baking posts you'll know that I like to do things with my own twist. This part is pretty long if you don't have a food processor, it probably takes me about 10 mins of bashing the gingernut biscuits into crumbs. The books tells you to put them in a plastic bag and start hitting with a rolling pin, however when I did this the bag of course popped and biscuits went everywhere. Too dramatic for my liking, so I just put them in one of my plastic bowls and hit with the base of my rolling pin. After all the bashing, you add melted butter and two tablespoons of caster sugar, mix altogether and put it in your cake tin. Put it in the oven for 10 mins on gas mark 4, when you take it out switch the gas mark to 1 and just leave the base to cool. This is quite straightforward as well, start with your cream cheese, I used Philadelphia because the book states that Philly is fine, so why not. Add your sugar and vanilla essence and mix together to a paste. The next bit is the bit I hate purely because it changes the consistency of the mixture, adding eggs. As soon as you add one it goes incredibly runny and the recipe tells you to add two. I just add one because in the past I have found that the mixture is so wet that the base lost it's "crunch". The next stage is to add the melted white chocolate and mix it altogether, then you simply add the ingredients to the cooled gingernut base. 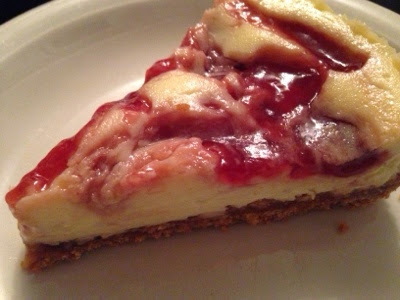 Melt a bit of raspberry jam and add blobs on to of the cheesecake and create a marbled effect on to using a knife or spoon whatever is easiest. Personally add as much or as little as you like, my family is a jammy kinda family so I added quite a few blobs. Once that's done you put it in the oven on gas mark 1 for 40 mins and then turn the oven off and leave it in there for about an hour with the door shut to cool down. I then take it out of the oven to let it cool further and then whack it in the fridge for another couple of hours, the book says 3 but as long as it's solid should be fine. Unfortunately the light was not in my favour when it came to take pictures of the final cheesecake but you can get an idea at least. Sorry it probably doesn't look that appetising, but I must tell you that it really was. I love that this cheesecake is actually baked and not just chilled it adds the extra step and you can taste the difference. I mean It's definitely not a recipe to do if you are short for time, with the cooling process, it is several hours but if you are busy doing other stuff then it's great because by the time you come around to eating the Raspberry Swirl cheesecake it's perfectly ready. Have you got any cheesecake recipes? That's a really good looking cheesecake! I haven't made a cheesecake in a really long time and I think I have to think more about it after seeing these pictures! ooooh that looks delicious!!! hungry now!!!! would you like to follow each other on GFC?! Let me know and follow me on my blog, I will follow you right back on both GFC and Bloglovin!